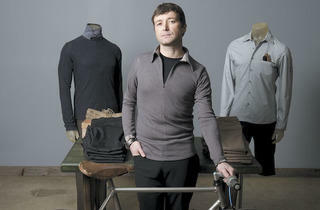 Chicago designer Jonathan Shaun’s menswear line Nonetheless looks good on your bicycle and in the office. Who he is Jonathan Shaun (who goes by Shaun) designed a snowboard clothing line, Weather Underground, in the 1990s. Since then, he’s dabbled in sustainability consulting, conscious marketing development, environmental retail strategies and digital media. He was involved with green clothing shop Nau when it had a location in Lincoln Park. And he opened Connect, the ecofriendly shop in Wicker Park that’s popular with cyclists and known for carrying great soft-shell jackets. 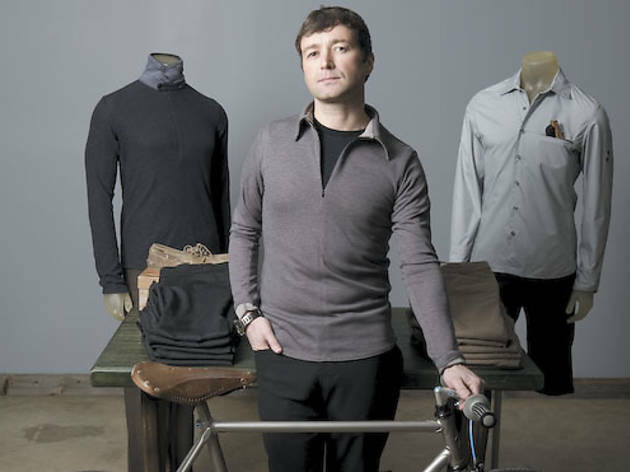 It was at Connect that Shaun saw a void in the marketplace: eco-conscious menswear that can be worn off the bike as well. So he went back to his roots and started a clothing line in his studio, upstairs from Connect. What he makes Even though the pieces in the Nonetheless line are suited for bike riders, the techy details are subtle. “We wanted to play up the menswear element,” Shaun says. “You can wear the Dispatch Rider pant on your commute, and they’ll still look great in the office.” The pants ($195) are made from a dress-suit fabric that’s machine washable and wicks away moisture. “It’s made from a wool-recycled-polyester-blend [containing recycled plastic bottles] and a small percent of spandex,” he says. “It actually saves eight to ten plastic bottles from the landfill.” Instead of overproducing a complete collection, Shaun releases a few pieces at a time. “I don’t drop collections,” he says. “I’d rather focus on quality over quantity.” For now, the made-in-Chicago line features the pants, plaid shirts and a long-sleeve polo, and it’ll eventually offer shorts. Customers who get tired of wearing the clothes can partake in the company’s Afterward Program, where they can send back gently used items from the line in exchange for a savings code. If you get in a bike accident and happen to rip your pants or shirt, you can exchange them for a smaller discount code. The gently used clothes will be resold in Connect’s vintage section. Where to find it For now, Connect (1330 N Milwaukee Ave, 773-360-1520) and nonetheless.cc. The line just signed with a showroom in New York, so expect to see Nonetheless in more shops by the end of the year.